Combining an element of fun with a much needed resource, PlayPumps International is a nonprofit collaborative helping to provide easy access to clean water in rural African communities and schools. The PlayPump system is a merry-go-round for kids to play on that also draws clean drinking water. Thanks to donor support from individuals, foundations, companies and governments, they offer play equipment and clean water to over a million people in Africa. 3.4 billion people currently live in water scarce areas. 2,000,000 children die every year from diseases caused by exposure to unsafe water. Play Pumps provides free, clean drinking water to over one million people using their innovative Play Pump system. (1) Children play on the Play Pumps merry-go-round. (4) into a 2,500 liter water tank seven meters above ground. (5) The water is then routed to a standard tap. (6) Any excess water is diverted back into the underground water source. 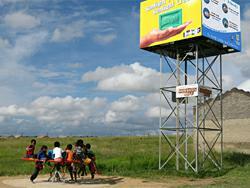 In order to cover maintenance costs each Play Pump water tank has four billboards around it. Two of the billboards are used for social, health and educational issues, while the other two are used for consumer advertising. For WorldWaterDay.org 2007, Play Pumps launched their 100 Pumps in 100 Days program. "From March 22 through June 29, PlayPumps International hopes to raise funds to provide clean drinking water to 100 communities - or 250,000 people - in sub-Saharan Africa. Each PlayPump costs $14,000 to build and install, with 10 years guaranteed maintenance, so we need to raise $1.4 million by the end of June if we want to reach 100 communities." You can donate and help the Play Pumps cause by clicking here. Jay-Z has teamed up with the United Nations and MTV to help bring awareness to the water problem. He has launched a world wide Water for Life Tour and has a video diary chronicling his experience with African children. You can view each diary segment by following the links below. As part of the Clinton Global Initiative, First Lady Laura Bush announced grants from the United States Government, the Case Foundation, and the MCJ Foundation totaling $16.4 million. 22 March 2007 "This merry-go-round is more than just for fun though, as kids play on it, the turning motion draws water from clean underground sources, pumping it out for all to use."